There are 6 good reasons why Francis Malbone House is my favorite place to stay. Location, location, location. This Inn is exactly where I want my sweet comforting inn to be. It’s close enough to return to, from wherever I happen to be, as often as I need to escape the crowds or take a load off my feet (for me, that’s at least twice in a long day of sight-seeing). I can lie down on my plush bed or sip tea in one of the gorgeously appointed, quiet common rooms or write in my journal in the tranquil walled courtyard, just a few steps from Thames. And then, when I’ve recuperated I can take another plunge into the bustle right outside my front door. Friendly and competent service. All the staff at Francis Malbone House (and especially Anne Maria who checked us in and out), have a way of making me feel glad that I spent my money there. They behave like good hosts, solicitous toward me, the dear guest. In Newport we’re paying a dear price, so you’d think every host would care about every guest a LOT, but not all of them are quite so skilled as FMH at conveying appreciation. Delightful Ambience and Comfort–everywhere. The beds are lush, the rooms are beautiful and posh, the common rooms are elegant, the courtyard garden is grand, it’s quiet, and everywhere there is an obvious attention to detail that makes the place luxurious but homey. I like traditional, not trendy decor when I’m in New England. And when I’m in Newport paying a premium price, I want to feel upscale, not shabby-chic, or worn-out antique-y. The Francis Malbone House feels richly Newport-y. The Gourmet Breakfast and the Gourmet Afternoon Tea (both included in the price of the room) are exceedingly fine. I especially appreciate the restorative afternoon tea-interlude. That saves the expense and the hassle of finding a full meal in the morning and a very substantial mid-afternoon tea/snack (from 3-6) with chef-prepared savory and sweet items baked fresh daily, which may include a variety of cookies, macaroons, brownies, lemon squares, cakes, tarts, cheesecakes, grilled pizza, roasted vegetables, cheese and crackers, hot dips. With all this food provided, I find that all I need for lunch is a small salad, or a cup of clam chowder. All of this makes the price very fair and reasonable–and in Newport, fair and reasonable is a very good deal. Plus–there is a nice-sized free parking lot right behind the inn for hotel guests only. So my car is as conveniently, centrally located as I am (and remember that if you lodge away from the harbor you’re going to have to pay to park near the harbor). Disclosure–I have not been paid to advertise or promote the Francis Malbone House, neither have I received any compensation in the form of free rooms or meals. My recommendation is based entirely on my happy personal experience as a paying guest there. None of the staff or owners knew, during my stays with them, that I might be publicly reviewing and writing about them. It was quite obvious to me that their policy is to treat all their good guests as graciously as they treated my husband and me. 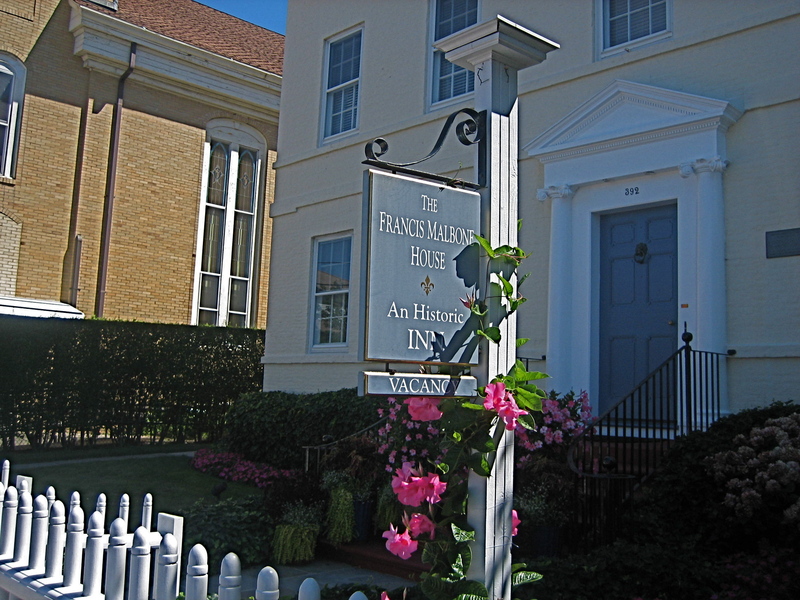 Not only is the Francis Malbone House my first choice for where to stay in Newport, it’s also one of my favorite places to stay in New England. What’s your favorite place to stay in Newport or New England or in the world? In a beautiful world like ours, it’s exceedingly difficult to name just one favorite place…. You’ve convinced me! 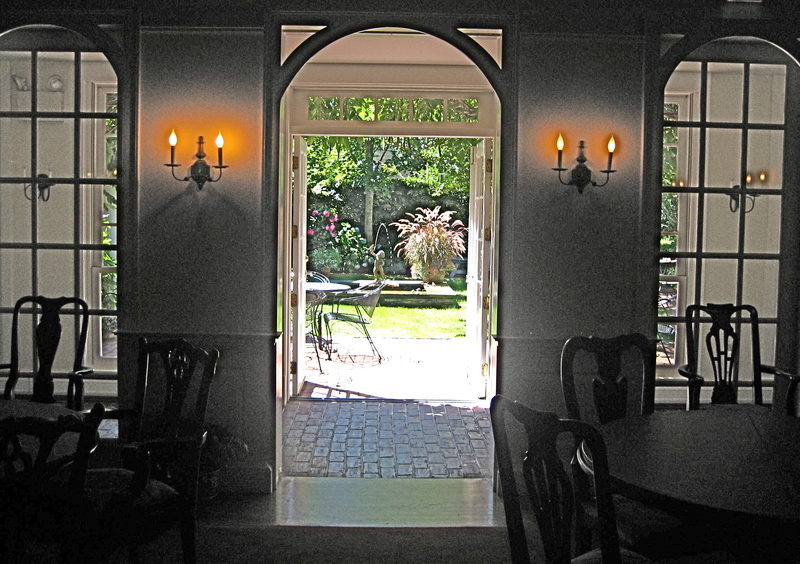 All the reasons are solid, but the view from the breakfast room into the courtyard sealed the deal! If I ever get to Chautaqua, I know where I’m staying! Ken and I directed a children’s theater production of LW&W a million years ago (back in 1994)–it was an incredibly rewarding experience. Of course, I had loved C.S. Lewis’ book long before we had the opportunity to do the play. Oh, it will happen one day–everything will come together and you’ll find yourselves with a few free days and you’ll be feeling like a celebration and you’ll think–hey, let’s go to Newport! And when you do, tell the good folks at FMH that I recommended them to you! I love Newport! The food is great and so much to see. Last time I was there I stayed at a B&B that was fairly well located. The woman running it was nice but parking was a nightmare. This sounds wonderful as I also need to rest between excursions! Parking really IS a big problem in Newport; it definitely helps to have insider information about where to stay and how to get around to help mitigate that frustration. And my health has long made it impossible for me to be on the go for 18 hectic hours (which seems to be the “normal” tourist pace). So I seek out destinations and itineraries that won’t make a wreck of me. But, it’s also a pace the people who travel with me find restorative, which is what I think a vacation ought to be!